The adage that a love affair or an event was "in the stars", meaning meant to be, gets taken quite literally in 2:22, the fantasy-romance thriller and decades-later sophomore effort from Paul Currie. There's a degree of mystical belief that follows along with that concept, in which sequences of events and the rise and fall of personal relationships simply cannot be changed by the trajectory that the universe has laid out … unless the stars themselves change, of course. Someone getting swept up in those musings in relation to their life certainly isn't a rare occurrence, but it's a little more difficult to stay engaged in a story that operates in such predestination, else the actions of the characters involved seem -- to a degree -- futile. The premise of 2:22 attempts to evade and investigate the mechanisms of predestination, but the bluntly-delivered and static nature of the story plays into that inability to alter one's path, which isn't helped by the film's hollow metaphysical fiat. Dylan Branson (Michiel Huisman), an air traffic controller who rides his bike to work through the city of New York on a daily basis, leads a life full of structure and predictability. When he's at work, maintaining order and organization is crucial, which plays into his inherent strengths of mathematical calculation and deduction of patterns. One day, however, he isn't so great at his job, where he's distracted by an inexplicable force that results in a very close call for one flight. In the aftermath of him getting rattled on the job, he meets Sarah (Teresa Palmer), an administrator for a local art gallery, and the two hit it off passionately. In the midst of their brimming love affair, however, Dylan begins to see flashes of the same -- or similar -- events happening around him on a daily basis, and he believes them to be tied to the disruption that caused his accident at work. Using his mathematical skills, he attempts to cipher what's going on, as well as how it factors into New York's Grand Central Station and the time 2:22. From the first glimpse at Dylan's day as he exercises, pedals through the city, and enters the air-traffic booth at work, 2:22 hits an cumbersome dramatic rhythm that seems less interested in the character himself than in the systemic nature of his routine. Like the mathematical clockwork of Dylan's mind, the film's moving parts are perceptibly setting up the supernatural revelations to come, made obvious with small emphasized details throughout -- dead bugs, water drops, car crashes -- as well as the bluntness of conversations that exist just for the sake of explanation. 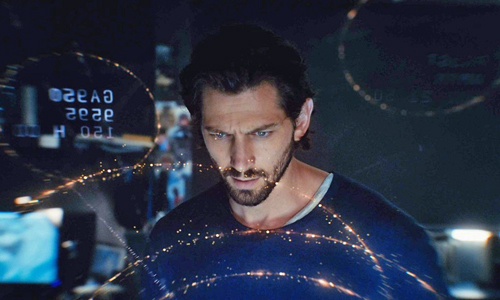 Despite the undeniable and effortless charisma of Michiel Huisman, the bluntness of the scripting plays more like something that'd show on Syfy than a grounded modern fantasy. It's as if the character establishment exists out of obligation to the mystery instead of wanting to dig into the intricacies of his potentially absorbing personality, an interesting one that involves a chip on his shoulder and an off-kilter, almost Beautiful Mind-ish perception of the world. The introduction of the romantic pursuits in 2:22 happens in sync with the rise of its supernatural elements, both arriving on the shoulders of Sarah, the woman whom enters his life out of a massive stroke of luck. Whether it's a war epic or a love story involving zombies, Teresa Palmer consistently brings an air of validity and sincere emotionality to any scenario, conveying a lot on a nonverbal level through her soulful, oftentimes bewildered glances and smile. Surrounded by cobalt-blue shadowing, flickers of stardust, and emphatic music that really, really wants the audience to endure a swell of emotion, the moment that she locks eyes with Huisman's Dylan ushers in the film's grand design involving the happenstance and destiny of these two strangers. In the here and now, it's an effective scene on the surface; however, the fated promptness of their escalating relationship and the scope of their mystical connection hurries through whatever natural buildup might've developed between ‘em. Everything that comes before almost seem practical in comparison to the web of coincidence and interconnectivity involved once 2:22 really kicks into gear. Revealing the extent of the nonsense isn't feasible without exposing the film's secrets, but one should prepare for a host of cosmic parallels and little substance to the rationale behind what's happening. When it's not resorting to sporadic explosions of glass or chandeliers crashing on the floor for excitement, the story gets stuck in a holding pattern while Dylan tries to puzzle out the repetition and congruences around him, touching upon abstract mysteries that exist in the same stylish sci-fantasy genre space as, say, Vanilla Sky or The Butterfly Effect. Murder cases, echoes of the past, and how they're impacted by the stars form into an odd mishmash of expectation and inertia in 2:22, and while there's grandness of scope to the answers behind it all, a lack of purpose and clarity behind Dylan's strange occurrences casts a cloud over its weightier motivations.